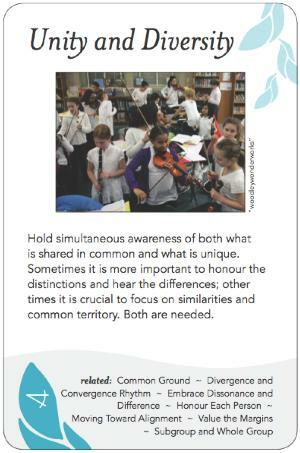 Hold simultaneous awareness of both what is shared in common and what is unique. Sometimes it is more important to honour the distinctions and hear the differences; other times it is crucial to focus on similarities and common territory. Both are needed. Invoking this pattern means keeping an awareness of both the whole and its parts, and the oscillating rhythm between them. Go too long giving attention to one or more individuals in a group, and the sense of the whole starts to wither as mission is replaced by self-interest. Go too far in the other direction, and individuals cry out for autonomy, and if their call is neglected, begin to drop away. Divergence and Convergence Rhythm, which is about how unity and diversity move through the beat of time. Practically speaking, a key program decision is when to stay in one big group and when to split off. This may be likened to the distinction between serial and parallel processing in computing and in human cognition. There are advantages to either. See more at Subgroup and Whole Group. As differences and similarities between people are always both present, part of the art of skilled facilitation is knowing when to bring attention to which. In particular, because many groups struggle to find unity, it is often the role of the facilitator to "tune their ears to the frequency of common ground," to notice what's held in common and to focus the group's attention on it. Amidst deep polarization, acknowledging experiences, values, or goals held in common can help reduce tension and get things flowing again. Ironically, it is sometimes through listening more deeply to one person's story that people are able to rediscover their interconnectedness--such a story may express universal human themes, such as the grief of loss, desire for stability, or concern for children. As you guide a group through the weaving of unity and diversity, you can help build their own awareness of the dynamic. Traditional consensus process (as practiced by Quakers and others, and with roots in ancient indigenous cultures) digs deep into the interplay between unity and diversity. The goal of groups using consensus as their decision rule is to find unity. However, that unity arises only through individual insight and sharing. A well-functioning consensus-based group that's been together for a while typically has stories of times when the whole group changed their mind after listening to one earnest dissenter. See The Special Place of Blocking in Consensus on Tree Bressen's website for more on this. In the ICA "Consensus Workshop" method, small groups (unity within each, diversity between) generate ideas via a "card-storming" process (diversity--brainstorming in writing such that each idea occupies a separate piece of paper). Similar ideas are then grouped together into clusters (unity), and each cluster is assigned a label by the group (more unity). The group then decides which actions to pursue related to each cluster. Similarly in Appreciative Inquiry, data is generated by individual interviews, then grouped by similarity. At that point the group decides what principled commitments it is prepared to make, and then generates a bunch of actions that would express each of those commitments. At the end there is a plan for how to check in and follow up to ensure real progress is made. Don't Just Do Something, Stand There! (Janoff & Weisbord), Principle 6: "Master the Art of Subgrouping." Masai hunter's ability to maintain triple focus on far horizon, the followed path, the back of the next person's head. “Oscillating Structure” - Robert Fritz. *DL: Question - It seems like Fritz's framing of this is universally negatve?